Game 5 of the 2015 American League Division Series will go down as one of the most memorable games in baseball history. The errors made by Elvis Andrus and the despicable display of sportsmanship by the Toronto fans made me think of Darrell Evans and the 1987 American League Champion Series. Darrell Evans was a star. He had a monstrous swing, and could play several positions. He also is remembered as the guy on base when Hank Aaron blasted home run number 715, breaking Babe Ruth’s hallowed record. Evans was the first player to hit 40 home runs in both leagues. And became the first player to hit 30 home runs after the age of 40. But Evans’ place in Tiger history was becoming the first major free agent to sign with Detroit. There was a reason those historic Tiger teams had a lot of home grown talent. It was because the Tigers were cheap. In 1984 Evans marked the first time Tiger management opened up their check book. In 1987- The Detroit Tigers were the best team in baseball, Well, at least they had the most wins (98). Evans was a major reason for the success of that season. The veteran left handed slugger, smacked 34 home runs and knocked in 99 runs. He also played great defense at both third base and first. The Tigers were picked to roll over the Minnesota Twins in the playoffs. Game 4 of the series saw the Tigers down 2 games to 1, and trying to tie the series. The Tigers were in good shape with Frank Tanana on the mound, and a home crowd eager to get their Tigers back on the winning track. 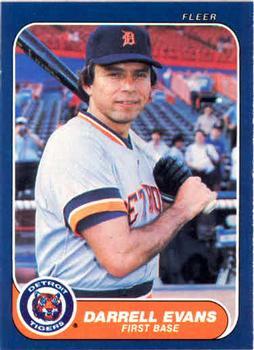 That was, until Darrell Evans had possibly one of his worst days on a baseball diamond. Evans started at First Base. There were runners on first and second when a hot smash came his way. Evans, scooped it up and tried to get the lead runner at third. The usually accurate Evans threw wildly to third, allowing a run to score. Two innings later, with Evans now playing third base, an easy grounder went right between his legs, allowing another run to score. The Tigers fought back, and were batting, down by 1 run. Evans was on third base with hot hitting Lou Whitaker at the plate. The Tigers were poised to tie the game, and tie the series. But for some reason, Evans, who was by far the slowest base runner in the Tigers line-up took a huge lead off third. Twins catcher Tim Lauder took advantage and picked Evans off at third, ending the threat. I can still remember Evans, on his knees in disbelief. There’s no nice way to put it. Evans singlehandedly lost the game for the Tigers. And, by going down 3-1, basically ended their season. If there were a way for Evans to crawl under the base, he would have. Would this be Evans’ legacy? Would he become the Tigers’ version of Bill Buckner? Would he be as hated as Steve Bartman? Would Tiger fans forget the joyful Evans being the first player out of the dugout when the Tigers won the World Series in 1984? Would they dismiss his 40 home runs in 1985, or discard his leadership that guided Detroit to the best record in baseball in 1987? In game 5, Evans came to the plate in the first inning. And Detroit fans let him know what they thought of him. The sell-out crowd, knowing Evans had basically blew their chances for another World Series championship – all came to their feet and gave the veteran a standing ovation. The cheers were so loud, and lasted so long, Evans’ eyes welled up with tears, and he had to step out of the batters box to compose himself. I sure hope Ranger fans greet Andrus with the same class. And I hope Blue Jay fans act with more respect when they are knocked out of the playoffs by the Royals. Posted in Detroit History, Detroit Tigers, Sports and tagged baseball, Darrell Evans, Detroit Tigers, Tigers.